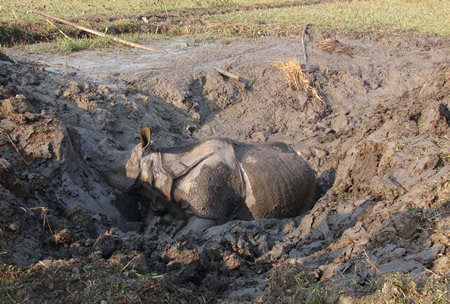 CHITWAN, Sep 10: A female rhinoceros was killed after getting trapped in a swamp near the Kuchwani Post in Chitwan National Park (CNP) this morning. CNP Assistant Conservation Official, Abhiyan Pathak, confirmed the death of the mature female rhino. The pachyderm got stuck on Saturday and was pulled with the help of an elephant. The rhino was too incapacitated and could not be saved. The muddy swamp was created by the massive flooding triggered by heavy monsoon downpours last month. On August 8, a rhino was killed in a collision with another near Icherni Post in CNP's eastern sector. A total of 25 rhinos have died in the last fiscal year due to various causes, according to CPN's Information Official, Nurendra Aryal.